It's 5 p.m. and you still don't know what to make for dinner! How about an delicious and easy Keto Chicken Cordon Bleu Casserole? You might be wondering how “easy” and “Cordon Bleu Casserole” could ever exist together in the same sentence. First, you have to pound the chicken breast, then roll it in ham and cheese, dredge in egg, roll in bread crumbs, fry it, and finally… finish it off in the oven. Oh, and also? The sauce! Can't skip the sauce. It's total comfort food, but such a pain to make! Thankfully, I'm here to show you how to cheat your way to Chicken Cordon Bleu flavors without spending all day in the kitchen. In fact, this casserole can grace your table in 30 minutes flat! Even better? 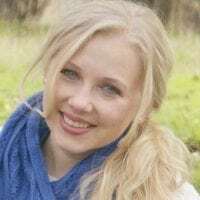 My version is low-carb so it's keto- and Trim Healthy Mama-friendly. I use cream cheese instead of flour to thicken the sauce, and Parmesan cheese in place of panko crumbs. 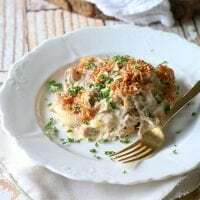 Be sure to include this Easy Keto Chicken Cordon Bleu Casserole in your menu next time you have leftover roast chicken and bone broth. It's so easy to whip up and is incredibly flavorful, you won't miss the “traditional” version. Cheat your way to Chicken Cordon Bleu flavors without spending all day in the kitchen. 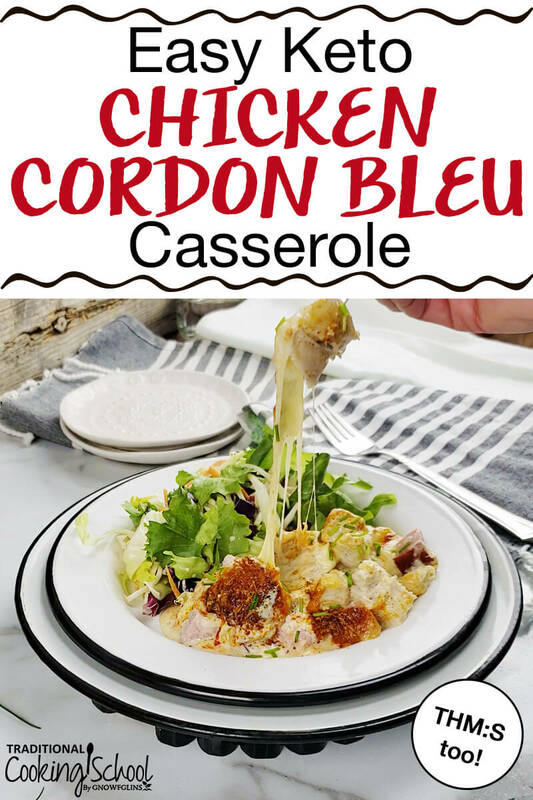 In fact, this healthy and easy Keto Chicken Cordon Bleu Casserole can grace your table in 30 minutes flat! Since it's low-carb, it's a Trim Healthy Mama S meal, too! Grease a 9x9" casserole pan with coconut oil, lard, tallow, butter, or ghee. Set aside. In a medium-sized bowl, combine chicken, diced ham and cheese. Using an immersion blender, blend all sauce ingredients together until fully combined and smooth. Pour the sauce over chicken mixture. Mix to combine. Transfer to prepared pan and spread evenly. In a small bowl, combine Parmesan cheese, paprika powder, and garlic powder. Sprinkle over chicken mixture. Bake for 20 to 25 minutes. Then broil on high for 3 to 5 minutes to create a crust. Remove from oven and enjoy immediately. Store leftovers in an airtight container for up to 5 days. What's your favorite way to enjoy Chicken Cordon Bleu? Have you tried it in a casserole? Five minutes prep time? Maybe if you’ve already cooked and shredded the chicken breast, and everything else is also chopped, mixed and ready to pour. I sous vided the chicken breast to maintain the best flavor, substituted local pork sausage (which I also sous vided for best flavor) and I found the mixing of the cream cheese with broth was quite messy. It probably didn’t help that I quadrupled the recipe for a holiday dinner for the book group and spouses. But even if one cooks the chicken breast in the crock pot or pressure cooker and uses ham, the prep (and clean up) time is quite a bit more than five minutes! I’m serving the meal tonight, so I’ll know how successful it is later, but the little bit I ate tasted good.